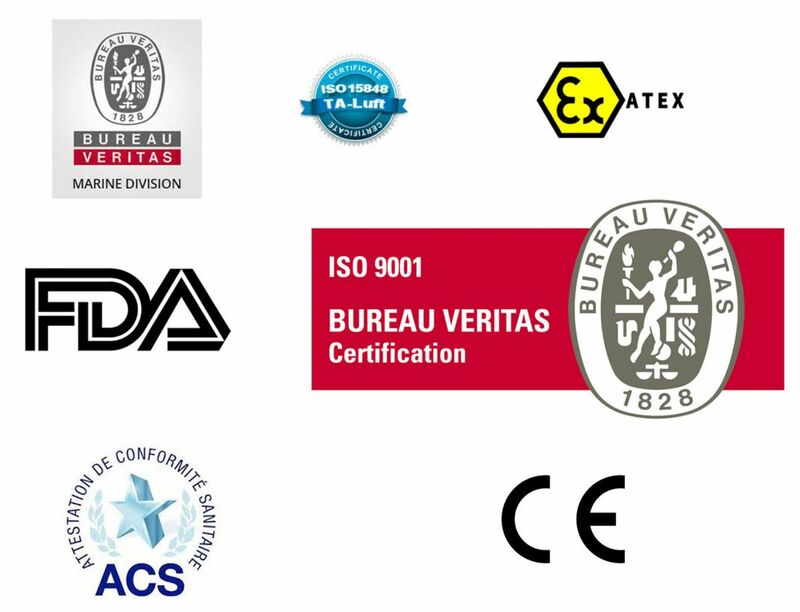 As an ISO 9001 certified company, quality is a value shared by everyone and not just a simple certificate. It is a daily organization well anchored in the group’s culture and structured by applied operating processes. Therefore our teams are audited on a regular basis and in turn the auditors. We have integrated into our ISO processes functions that are usually excluded from the scope of the norm, like finance or IT. All of the company is hence working towards a single objective : the satisfaction of our customers and stakeholders. As a member of directives committees, we carefully apply the directives and standards in force in the design, production and control of plastic valves and their accessories. We have also defined our own standards which are more restrictive than current standards. For example, 100% of the valves manufactured by SAFI undergo a tightness test. Products suitable for drinking water systems. Products complaint with European regulation n° 10/2011 of January 14, 2011 concerning plastic materials and objects intended to come into contact with comestibles. Products approved by BV Marine for « Steel Ships », « Yachts », and « Offshore Units ». Products compliant with the requirements of EN ISO Standard 15848 (Class B) and German standard TA-Luft VDI 2440, which define the criteria for external leak of sealing systems.